Section 1. Name. 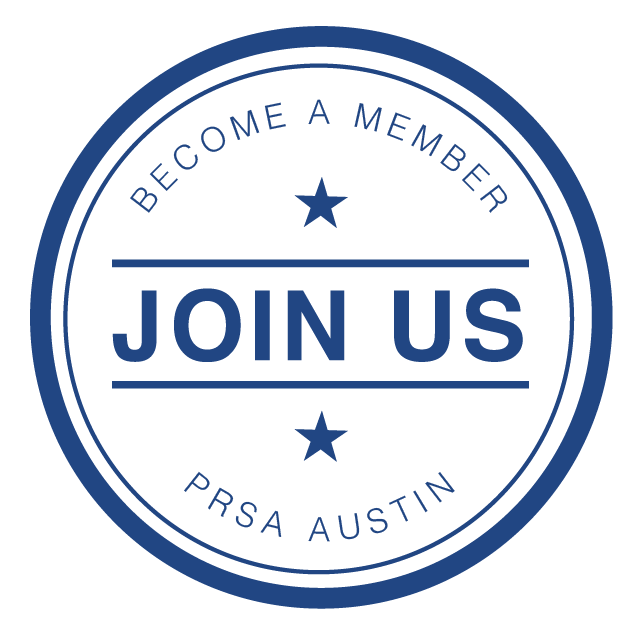 The name of this organization is the Austin Chapter (“Chapter”), and is a chapter of the Public Relations Society of America, Inc. (“Society” or “PRSA”). Section 2. Territory and Location. The Chapter will operate and serve members within the territory approved by the Society, and its principal office will be located in a place determined by the Chapter’s board of directors. The territorial limits approved by the Society for this Chapter are the City of Austin and surrounding communities not within another Chapter’s jurisdiction. Collaborative environments for sharing of best practices across markets and industries. Open discussion of industry happenings and issues. Section 3. Rights and Privileges of Membership. Membership carries with it a definitive obligation to pay all applicable dues, fees and other charges (collectively referred to as “financial obligations”), as provided in these bylaws and as determined by the board from time to time. Any payment by a member to the Society does not mitigate such member’s financial obligations to the Chapter. (a) Membership is automatically terminated without action by the board for failure to pay applicable dues for more than sixty (60) days after payment is due, failure to meet the eligibility requirements for membership, or when the membership to the Society has been terminated for any reason, including non-payment of dues. Section 5. Dues. The amount of Chapter dues shall be fixed annually by the board. Any member whose Chapter dues are still unpaid sixty (60) days after individual membership dues should be received shall not be in good standing, and shall not be entitled to vote, hold office or enjoy other privileges of Chapter membership, provided such member has been duly notified. (a) There shall be an annual membership meeting each year held fourth (4th) quarter at such date, time and place as may be designated by the board. (b) In addition to the annual meeting, there shall be regular membership meetings at such times and places as may be designated by the board. (c) Special meetings of the Chapter may be called by the president, the board or on written request by twenty-five (25) percent of the Chapter members. (d) Notice of the annual meeting shall be given to each member personally by mail, electronic mail or other mode of written transmittal at least thirty (30) days prior to the meeting. Notice of a regular meeting or special meeting shall be given to each member at least ten (10) days in advance. (e) A quorum for membership voting is twenty-fine (25) percent of the voting members present in person. (f) An electronic voting mechanism may be implemented upon discretion of the president, with approval of the board. Section 2. Board Composition. The governing body of the Chapter shall be a board of directors consisting of the president/PRSA Leadership Assembly delegate, president-elect/PRSA Leadership Assembly delegate, secretary, treasurer, past president, and four directors-at-large (committee members shall be considered extensions of directors-at-large). Directors and officers shall be members in good standing with the Chapter and the Society. Directors and officers, except for the president and past president, shall be elected by the Chapter membership at its annual meeting for a term of one (1) year, beginning Jan. 1 and ending when their successors are elected and installed. The board shall set forth the nomination and election procedures and make such procedures available to the membership. Section 3. Chapter Officers. The officers of the Chapter shall be a president, president-elect, secretary, treasurer and past president. The offices of secretary and treasurer may be combined and held by the same person at the discretion of the board. The officers, except for the president and past president, shall be elected by Chapter membership at its annual meeting for a term of one (1) year, beginning Jan. 1 and ending when their successors are elected and installed. No officer having held an office for two successive terms shall be eligible to succeed himself/herself in the same office. Section 4. President. The president shall preside at all meetings of the Chapter and of the board. He/she shall appoint all committees with the approval of the board and shall be an ex-officio member of all committees, unless otherwise provided by the board. The president shall perform all other duties incident to the office of president. The president shall immediately succeed to the position of past president upon expiration of the president’s term of office. The president or his/her designee shall serve as a PRSA Leadership Assembly delegate. Section 5. President-Elect. The president-elect shall assist the president, perform all duties incident to the office of president-elect and, in the absence or disability of the president, shall exercise the powers and perform the duties of the president. The president-elect shall immediately succeed to the office of president upon expiration of the president’s term of office, and in the event of the death, resignation, removal, or incapacity of the president. The president-elect or his/her designee shall serve as a PRSA Leadership Assembly delegate. Section 6. Past President. The past president shall advise on matters of Chapter protocol and counsel the president if necessary on issues pertinent to the Chapter. The past president shall perform these duties and immediately roll off of this position after one year. Section 7. Secretary. The secretary shall keep records of all meetings of the Chapter and of the board, issue notices of all meetings, maintain or cause to be maintained the roll of membership, and perform all other duties customarily pertaining to the office of the secretary. Section 8. Treasurer. The treasurer shall receive and deposit all Chapter funds in the name of the Chapter, in a bank or trust company selected and approved by the board. He/she shall issue receipts and make authorized disbursements by check after proper approval by the president or board. He/she shall prepare the Chapter's budget, make regular financial reports to the board, render an annual financial statement to Chapter membership and perform all other duties incident to the office of the treasurer. Section 9. Leadership Assembly Delegates. The PRSA Leadership Assembly delegate(s) shall serve as the Chapter's representative(s) at meetings of the PRSA Leadership Assembly, and as a liaison between the Society and the Chapter. The Chapter president and/or president-elect or his/her designee shall serve as a PRSA Leadership Assembly delegate. In the event that additional Assembly Delegates are required, the Chapter president will appoint delegate(s) as needed. Section 10. Vacancies. In the event of death, resignation, removal or expulsion of any officer or director, other than the president who shall be succeeded by the president-elect, the board shall elect a successor who shall take office immediately and serve the balance of the unexpired term, or until the next annual election. (a) Any director who misses more than three (3) consecutive board meetings without an excuse acceptable to the board may be given written notice of dismissal by the Chapter president and replaced in accordance with Section 10 above. (b) Any officer may be removed from his/her position by: (1) two-thirds (2/3) of the members voting where a quorum is present, or (2) three-quarters (3/4) of the full board, excluding the officer proposed to be removed. Any officer proposed to be removed from his/her position shall be provided with advance written notice, including the reason for the proposed removal, and must have an opportunity to respond to the proposed removal in writing or in person. Section 12. Board Meetings. There shall be regular meetings of the board at such times and places as it may determine. It shall meet at the call of the president, president-elect or past president. Notice of each meeting of the board shall be given personally by mail, electronic mail or other mode of written transmittal to each director at least seven (7) days prior to the meeting. Proxy voting is prohibited at board meetings. Section 1. Appointment and Dissolution of Committees. Committee members shall be considered extensions of directors-at-large. Each director-at-large shall serve as a committee chair and/or as a liaison to at least one committee. The board may appoint and dissolve committees to carry on the affairs of the Chapter as the board deems necessary or advisable. The board shall determine the duties of any such group, as well as its size and tenure. All committees established under this section shall be subject to the authority of the board. These bylaws may be amended by a two-thirds (2/3) vote of the members present at the annual meeting (4th quarter), provided such proposed amendment(s) has been approved by the Chapter's board, and at least thirty (30) days' notice has been given to all members of any proposed amendment(s). Amendments adopted in accordance with this provision become effective only after approval by the Society's board. Section 5. Assets of Chapter and Dissolution. No member of the Chapter has any interest in, or right or title to the Chapter’s assets. Should the Chapter liquidate, dissolve or terminate in any way, all assets remaining after paying the Chapter’s debts and obligations shall be transferred to the Society or, in the event that the Society ceases to exist, to such organizations organized and operated exclusively for charitable, educational, religious or scientific purposes and exempt under Section 501(c)(6) of the Internal Revenue Code of 1986 (or the corresponding provisions of any future United States Internal Revenue law), as the Chapter board shall determine. In no event may any assets inure to the benefit of or be distributed to any member, director, officer, or employee of the Chapter. Section 7. Fiscal Year. The fiscal year of the Chapter will be the calendar year. Section 8. Remote Communications. To the extent permitted by law, any person participating in a meeting of the membership, board, or committee of the Chapter may participate by means of conference telephone or by any means of communication by which all persons participating in the meeting are able to hear one another and otherwise fully participate in the meeting. Such participation constitutes presence in person at the meeting.